Simulated portfolio returns 16% beating S&P’s performance of -1.0% in Q1 2018. ENCINITAS, Calif. - April 6, 2018 - PRLog -- The net return of the Trade Ideas' simulated portfolio for Q1 2018 was 16% after commissions in Risk-On mode. These results were achieved by the company's A.I.-powered investment discovery engine named 'HOLLY.' The portfolio's gross return, beforecommissions and fees, measured 19%. These results compare to the S&P 500, measured by the $SPY index, which returned a loss of -1.0% over the same period. Risk-On performance reflects a bias towards staying in the positions beyond reward targets while strictly adhering to risk targets for each trade. Unlike Risk-Off mode, where reward actions do not deviate from trade plan parameters and risk management rules permit exits earlier if existing profits erode significantly, Risk-On mode carries all trades the entire day until the close. This mode is often present during days of momentum which typify the majority of trading days in the first quarter of 2018. 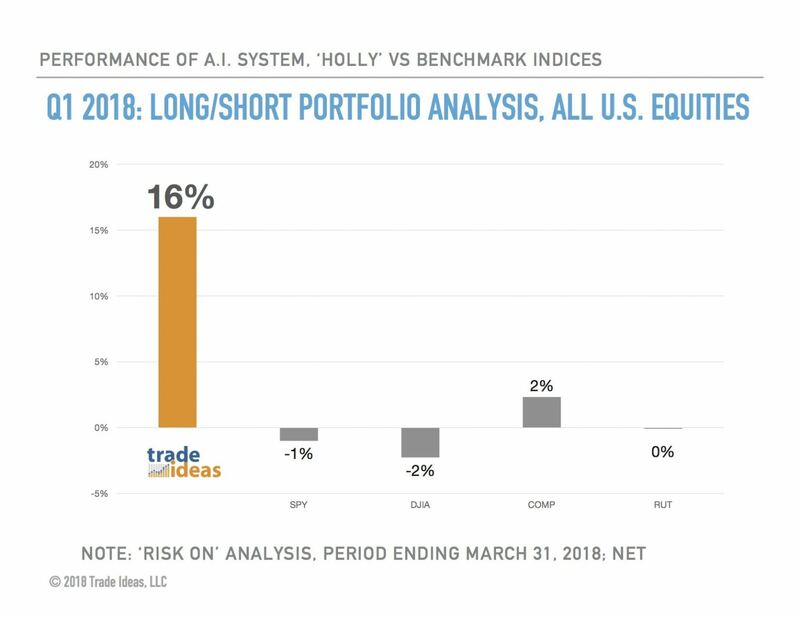 Note that Holly's Risk-Off performance for Q1 2018 returned a smaller loss of -0.45%. "We're entering our third year of benchmark exceeding performance with our machine learning, A.I.-powered innovation. Third-party research auditing Holly's performance point to its consistent ability to capture alpha across sectors, long and short, and across multiple market cap levels," said David Aferiat, Co-Founder and Managing Partner of Trade Ideas. "We're not resting on any laurels either. We're adding new alternative data sets for analysis like cryptocurrencies this year and we're innovating further on the machine learning protocols. For our subscribers, all this work translate into better decisions in the markets. At any time they can access the daily A.I. generated algorithms for actionable intelligence while retaining control to make trades according to their own rules. We're unique in providing such results via an A.I. powered SaaS model." The maximum amount of alpha possible for Holly is the summation of all the correct decisions on whether to apply risk-off or risk-on modes to each trade idea. Under this 'maximum alpha possible' scenario, i.e., taking the best of risk-on and risk-off modes, Holly yields 27.5% net commissions and fees for the first quarter of 2018. "Quarter after quarter benchmark-beating performance for over 2 years is not the only measure of success we're tracking at Trade Ideas. Our revenues are at all-time highs and reflect what our growing subscriber base from Interactive Brokers, TD Ameritrade's Think or Swim, ETRADE, and many more already knows: Trade Ideas separates the signal from the noise and shakes up the fintech community. See it for yourself," observed Dan Mirkin, CEO and co-founder of Trade Ideas. "You'll either be using this innovation to capture alpha or others will be using it against you to get theirs. Advisors and professionals have an entirely new way of not just talking to their clients about leveraging technology, but in generating alpha for their portfolio." Performance of the Trade Ideas simulated long/short equity portfolio reflects historical daily paper trades in the U.S. and Canadian equity markets. It is not a backtest. Trades are initiated from the daily list of algorithms published by the A.I. system, named 'HOLLY', and the result of its overnight optimization analysis or 'Quantitative Combine(TM).' The portfolio started with a $1M beginning balance on January 2, 2018, and used $80k (rounded) worth of shares per trade. Commissions are calculated at $0.0075 per share and reflected in the net performance (shown in chart). Slippage is not factored. Short trades assume that customer's broker has access to short inventory for the trades identified by Trade Ideas. In order to showcase the effectiveness of the trades identified by HOLLY for the simulated portfolio, no positions are held overnight. This avoids any conclusion that the outsized return of the A.I. system is the result of one or a handful of successful positions held for weeks or months. Detailed trade data is available from Trade Ideas and can be segmented by gross and net performance, market cap, and by time periods. The Trade Ideas simulated portfolio is transparent, consistent in data processing, and free from selection or survivorship bias. Its inception date is January 4, 2016. Sign up to receive Trade Ideas' Trade of the Week every Monday with the trade details, charts, and the reason it's chosen. Next step: Schedule a demo or find out more about Trade Ideas LLC by calling (760) 230-0713 or visiting http://pro.trade-ideas.com/. Also be sure to vote for Trade Ideas in the upcoming Benzinga FinTech Awards (https://benzingafintechawards.com/vote-2018/trade-ideas-llc/), May 2018 in NYC.